There are many different kinds of cold. I’m a bit chilly in my heated house only because I keep the thermostat low to save both energy and costs. So for me, cold is a choice. For many of us, though, the cold-choice on these wintry days is where to find some temporary warmth before heading back out into the dripping ice-world that is Philadelphia in February. Clusters of people hanging out in the courtyard at St. Francis Inn, standing in the snow, wrapping their cold hands around the warming cups of oatmeal and hot coffee dispensed through the Inn’s window. A handful of men and women who are homeless and some shelter residents discuss their favorite daytime places to go to stay warm: the library, hospital waiting areas, the train station, and for those with tokens or Senior passes for public transportation, the El or suburban shopping malls. A few of these folks look really old. I ask their ages. 76. 84. 87. Many worked for most of their adult lives, and in their retirement find themselves without a permanent place to lay their heads. Cold. And then there is Danny, seeking shelter and medical help. Having completed a multi-year prison term a few days ago, he was given a bus ticket and good luck wishes from the PA Department of Corrections, then sent on his way. He inadvertently lost his small bag of possessions in a bus transfer halfway across the state, and arrived in Philadelphia with no income, no medications, some social service appointments scheduled for next week, but in the meantime, no home: Mom and Grandmom both died while he was in prison. Danny stayed in a hospital waiting room all night to stay warm. Today he is out in the cold. But perhaps most daunting, is the coldness of our hearts, our hardened attitudes toward those living on the social margins. A few days ago, a Philadelphia Inquirer article noted increasing negativity toward people who are poor. In hard economic times, the middle class incubates and articulates harsh, critical opinions about people who are economically distressed, blaming them for their own suffering. You can read all about it and get the synoptic psycho-social analysis of this phenomenon here. At its core, though, such frozen-hearted thinking is the result of an endemic belief that we are separate from and superior to people who are poor. In a country where most people self-identify as ‘religious’, this is downright shameful: all major spiritual traditions teach that such notions are not only illusory, but spiritually and socially deadening as well. We are One. If you are hungry, my belly rumbles. If you cry, I taste salt. If you are cold, I shiver. The World is thawing, though, both literally and figuratively. 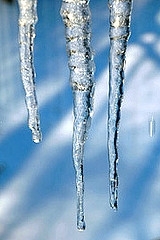 During these lengthening February days, the steady drip drip drip of melting snow and icicles reminds us that ‘frozen’ is simply a temporary condition: with a little warmth and Light, even hardened, rock-solid ice eventually is transformed into flowing, life-sustaining water. What is frozen, even seemingly hard and impermeable hearts, can be warmed and melted. And there are hopeful signs that as a species we are moving in fits and starts toward a sure knowledge of our Oneness. More on that in a future post….. Opening our hearts to people living on the edge is a choice. These human hearts are made for expansion, to be enlarged by compassion for each other. The challenge is to get past our own judgment, fear, and ego, and choose to stand in the Light, to allow what is frozen in us to thaw. All of us, rich and poor alike, harbor a freezer of some dimension somewhere in our hearts; we’re all stuck in some way. And all of us are in sore need of a Thawing Grace, which happily, we can choose to embrace. Previous Listening Post #13: Social Service Providers: Does Your Bread Give Life? I am no lover of religion, but, to quote a verse I’ve heard (mis)used over and over- “God gives to those who have”. It is very easy for say, a Christian, to have absolutely no remorse for wishing the poor would be wiped from the face of the earth because the religion can be used to teach that God grants favors ‘to his own’ and that anyone who appears to have been skipped over by God deserves their punishment. Further, once a Christian has fulfilled his religious (and by extension, societal) obligation by tithing, then s/he owes no one a penny more. In my view, the deliberate misinterpretation of scripture by, first, churches that wanted to enrich their coffers, and secondly by modern day preachers who make no pretence of keeping the offerings themselves, the whole idea that I am my brother’s keeper has gone out of the window. The second is Man’s priorities are upside down. Rather than build homes we build bombs to bomb houses. In the place of tablets we prefer to manufacture bullets. World over, Man’s preoccupation is on accumulation of power and private (or national) wealth. For sure, the world has more than enough resources to clothe, feed, house and medicate all its inhabitants. Without doubt. However, because we, who have taken upon ourselves the mantle of controlling the worlds resources, have decided to keep the majority hungry and poor so that a few can live as Kings, Queens, Princesses and Princes. And we have fought long and bitter wars any system that called for the equal distribution of the world’s wealth. So the person who has hardened his or her heart against the poor is, though by no means excused, a small micro-symptom of the larger malaise that humanity as a race, suffers from. That said, we do not need to be mad just because our neighbor is mad. In our own little ways, we can and should reach out to those we can, in any manner that we can, and make a slight difference in someone’s life. I have learnt that even a smile, a greeting, a kind word or a thoughtful gesture can really make a difference in someone’s life. And sometimes, even giving hope is all a desperate soul needs, to move from the brink of despair. I do my bit. I don’t advertise it, I don’t brag about it, I don’t use it to show others how good I am. I just do it because it needs to be done, because I want to do it, and because in my silent way, I want to make a change. And yes, it feels good too! Way forward- one day we’ll figure out a way to make charity big business for the common man and woman, to make it worth big bucks to an institution or country to spend time and resources on helping others rather than on building war machines. And then helping your brother, nay, being your brother’s keeper will be not just fashionable, but the business to be in!